Finding a basketball for both indoor and outdoor courts is not an easy task in itself. Add to that an under $20 budget and you will face some challenging issues. If there ever was a model that managed to satisfy all of our criteria, that would be Baden Crossover Flex Composite Basketball. This amazing model can be purchased well under $20 and it comes in three standard sizes and three different colors. It features something that Baden calls New Flex Composite cover. This cover is designed to offer a game ball feel, good grip, and control. After reading a lot about this ball on the Internet, we decided to put it to the test and really figure out why this model is so popular and well received. Baden has always been known for creating quality equipment and this ball is only the confirmation of that reputation. That new flex composite cover they brag about is really something you would not expect on a lower-tier priced ball. It offers loads of grip while being quite durable at the same time. The pebbled surface offers optimal grip for both dribbling and shooting and we really enjoyed it. Symmetrical channels may take some time to get used to but once you do, they provide excellent rotation control during the release. This ball feels like it belongs to a way higher price category. It is always a difficult task to assess the bounce quality of balls designed for multiple surfaces. Baden Crossover Flex Composite basketball performed excellently on our bounce test and hats off to Baden for making one hell of a ball. No matter how hard we pounded it, what surface we used and how hard was it inflated, it remained consistent from the first to the last bounce. Flight stability is on a satisfying level and you could always be certain that the ball will end up exactly where you sent it. 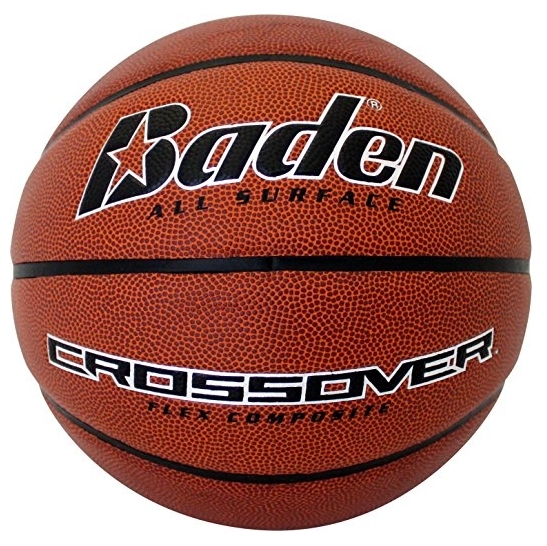 Baden Crossover Flex Composite basketball looks, performs and lasts as if it belongs to a much higher price tier. And this is not just our opinion. 4.6 star average user rating only goes to prove that you will have a hard time finding a better model in the price range of under $20. This model performs well both indoors and outdoors and for as much as we could find out about it from the people who own it, it has no major flaws. In fact, considering that you can get this ball in three colors and sizes, we feel that it has no flaws at all.